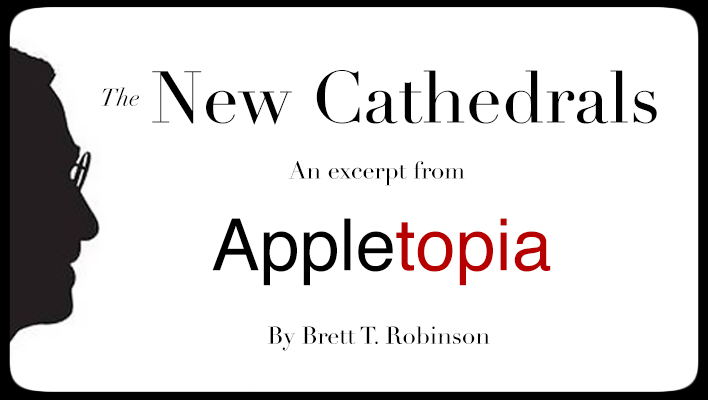 The following is an excerpt from Brett T. Robinson’s new book Appletopia: Media Technology and the Religious Imagination of Steve Jobs (Baylor University Press), available starting August 15th. The transcendent design of the Apple store fits a historical pattern wherein the dominant media technology of an age acquires a sacred status. The baroque design of the Library of Congress in Washington, D.C., and the vaulted ceiling of the Long Room in Trinity College Library in Dublin are testaments to the sacred status granted to books as precious vessels of knowledge and cultural patrimony. When books were king, their homes were built in the highest architectural style of the day. Libraries were imagined as sacred spaces because they were instruments for transmitting culture to future generations, promoting community, and organizing chaos. The Apple Store also resembles La Grande Arche in Paris, a massive cube built to honor the secular humanitarian ideals of postwar France. La Grande Arche is large enough to fit the Notre-Dame Cathedral inside its 348-foot-wide hollow center. La Grande Arche stands in stark contrast to the curvaceous Notre-Dame Cathedral, a baroque building representing old world tradition and fading cultural authority. The modernist cube buttresses the sky, not with spires and gargoyles, but with precise lines and angles, a symbol of rational and disenchanted cultural aspirations. Despite their aesthetic contrast with the cathedrals of old, La Grande Arche and the Apple Store both represent a social order that is deemed inviolable, clothed with an aura of factuality, and vigorously maintained by its adherents. Both monuments to modernism glorify technology and the secular ideals of the age. The beliefs and values of the technological age are embedded in a web of cultural relationships. The representation and practice of technology are composed of a diffuse set of rituals and rhetoric that resist tidy categorization. Architecture provides a few clues about the beliefs and values of a particular age, but it is in the popular texts of the mass media that a more detailed picture emerges. The images and slogans of technology advertising provide a computer catechism of sorts, teaching the consumer the goods (and evils) of different products and services. Just as the stained glass and statuary of medieval cathedrals educated converts and the illiterate, the iconic images and parables of advertising reveal the virtues of new technology to the buying public. The iconography of the Apple computer company provides a fitting case study for looking at the ways in which technology and the sacred have been conflated in the modern age. The Apple brand is the latest in a long line of American symbols that have captured the national imagination and spawned a “cult” of loyalists. Well before Apple, the most photographed sites in the early twentieth century were places like the Grand Canyon and the Golden Gate Bridge, where tourists united in a collective sense of wonder and nationalism. Standing at the gaping mouth of the Grand Canyon evoked dread and awe, a mix of emotions that made for a sublime encounter. The orientation of personal technology is like its name, highly personal—directed toward the individual rather than the collective. It has led to what the famed sociologist of religion Emile Durkheim called the “cult of the individual.” Durkheim saw the cult of the individual on the horizon as a strong theoretical possibility given the speed with which rationalization was draining religion of its power to provide a meaningful social bond. Transcendence was no longer something to be sought “out there.” The sacred relocated to the subjective experience of the individual. With the advent of personal technologies— symbols of radical individualism realized—the theory appears to have some value. The history of Silicon Valley provides a fitting backdrop for reading the American religion of technology. When Steve Jobs set up shop in his parents’ garage to start work on the first Apple computer, a significant cultural shift was under way. Prior to the personal computer, the machine of highest rank in the great chain of automation was the automobile. At the dawn of the information revolution, it was the car, not the computer, that signaled the coming shift in consciousness that would transform the American landscape. In the early 1900s, the El Camino Real corridor of California was home to dozens of mission churches built by Spanish Franciscan friars to convert and evangelize the Native Americans of the region. The churches were beautiful, built in the Spanish mission style, and they brought a sense of old world mystique to a region that would end up being defined by innovation and technology. Eventually the glory of the mission churches faded as California became ripe for development. Like those of most states in the early twentieth century, the California landscape was being remapped by the highway system to make way for the automobile. A sampling of tourist photos from the 1920s shows a steady stream of travelers stopping for photo ops in front of the missions with their cars positioned prominently in the foreground. The trip up the California coast, with the infinite expanse of the ocean on one side and portals to the divine on the other, was a motorist’s dream, a way of escaping the everyday. It became one of the most popular automobile tours on the continent. Tucked into the northern leg of the El Camino Real is the present-day Silicon Valley. Bordered by the Santa Clara Mission, Silicon Valley is sacred ground for those invested in the culture of digital technology. The transformation of El Camino Real from religious-automotive pilgrimage to mecca of modern technology is an allegory for the digital age. It reveals our manic desire for transcendence and all of the means by which we seek it, from religion to cars to computers. Churches, cars, and computers share a secret affinity. They help us escape. The really special ones are works of art. Chartres, Ferrari, and the iPod are all cathedrals—each one transporting us in different ways. It is fitting then that the Apple computer—the machine that would become the icon of technological sophistication in the information age—was born in a garage. In December 1980, the Apple computer company went public, and the success of the stock offering eclipsed the previous record-setting offering by Ford Motor in 1956. In retrospect, this fact is not surprising given the industrial heights to which Apple would eventually ascend. But Apple and Ford are linked by more than their monetary success and iconic status. Cars and computers are built to transport the user—one moves the body and the other moves the mind. Both machines changed our relationship to space and time. Automotive transport necessitated the suburb and the superhighway. American maps had to be completely redrawn to record the vast network of highway and byway arteries that became the nation’s circulatory system. Not to be outdone, the growth of electronic communication gave the country a nervous system. Not only could people and materials be transported at high speeds, speech and image could be transmitted at the speed of light. The country was linked by telegraph, telephone, radio, television, and then computer. Private and mobile transcendent experiences were being realized as both cars and computers overcame physical limits. The communication revolution inspired a slew of sublime rhetoric. In the early days of the personal computer, Nicholas Negroponte of the MIT Media Lab waxed prophetically that our world would be irrevocably changed by the immateriality of bits replacing the materiality of atoms. With the growing popularity of ebooks and the slow death of print newspapers, Negroponte’s predictions echoed the prophecy of Victor Hugo’s archdeacon in Notre-Dame de Paris, “this will kill that.” Negroponte’s rhetoric of digital technology bears the traces of ancient gnostic yearnings to escape the bonds of physical materiality to become one with sacred knowledge, or gnosis. This pattern of rhetorical transference between the technological and the transcendent has found ample purchase in the Apple story. With Apple and Steve Jobs, the sibling relationship between technology and transcendence is writ large. Apple’s religiosity has been attributed to everything from the company’s “forbidden fruit” logo to the fervent devotion of Apple consumers who make pilgrimages to Apple stores and defend the brand against the heresies of Microsoft. However, the company’s evocative symbols and devoted users are symptomatic of a much deeper transformation at work in the culture. Our minds are sort of electrochemical computers. Your thoughts construct patterns like scaffolding in your mind. You are really etching chemical patterns. In most cases, people get stuck in those patterns, just like grooves in a record, and they never get out of them. It’s a rare person who etches grooves that are other than a specific way of looking at things, a specific way of questioning things. 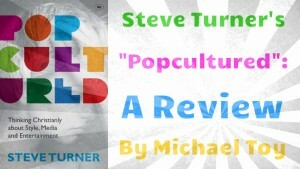 It’s rare that you see an artist in his 30s or 40s able to really contribute something amazing. Of course, there are some people who are innately curious, forever little kids in their awe of life, but they’re rare. The chemical patterns etched by the habitual use of personal technology are changing the way we think, act, and feel. As a result, cultural practices like religion are beginning to change as well. When religious ideas were locked away in monasteries and printed on manuscripts, religious authority was centralized. The printing press democratized religious interpretation and put religious texts into the hands of many. The mass production and distribution of theological, philosophical, and scientific ideas was a watershed moment that remapped the intellectual and spiritual landscape of the West. In the age of the personal computer, popular religious positions have become even more diffuse—a symptom of the powerful and personalized technologies we use to communicate. The computer is more decentralized than are printed books. Tim Berners-Lee, lead architect of the World Wide Web, noted the parallels between his Unitarian Universalist faith and the decentralized architecture of the web, designed to encourage tolerance and a mutual search for truth. The ethic of the Internet age is rooted in free expression, a breakdown of hierarchy, a sense of individual empowerment, and a distrust of central authority. Each of these developments poses a threat to traditional religious institutions. It should be no surprise that religious participation has faltered rather than flourished since the birth of the television and the computer. This is not to say that technology is the only factor in the erosion of religious influence, but the correspondence of the two trends is more than coincidence. The void left by fading religious authorities and the ethic instilled by technology use may favor a more libertarian approach to spiritu- ality and belief, but the desire for transcendence persists. When the shared sense of transcendence recedes from the wonders of nature and the baroque cathedrals of religion, enchantment is sought elsewhere. Digital images of the sublime, from the Grand Canyon to the outer reaches of the cosmos, now live on computer desktops and screen savers as constant reminders of the human desire to see beyond the blandness of routinized work. The computer provides a mode of escape and an invitation to dwell in an alternative universe of imagery and information. Education and catechism in the technological religion extend into all areas of cultural life. Children are introduced to communication technologies in the home at a very early age. The millennia it took for man to move from oral communication to print communication to electronic communication have been condensed to a few years for the young initiate. Once the initiate is in school, the educational environment provides further training in computers and media literacy. By high school, many children are outfitted with laptops purchased by the school. The ritual use of computers and cell phones by young people places them in “imagined communities” where relationships consist of text messaging, email, and sharing other bits of media. The use of cell phones, laptops, and tablets has skyrocketed over the past decade, and the trends show no signs of slowing down. Americans spend between eight and nine hours a day in front of some type of screen. While the television still accounts for the bulk of screen time among Americans, the computer and mobile devices are quickly encroaching. Among eighteen- to forty-four-year-olds, the combined time spent with computers and mobile devices is nearly equal to television screen time. As screen time increases, the character of social and cultural life changes. A Latin phrase is frequently repeated in the Catholic Church: lex orandi, lex credendi, lex vivendi, which can be translated, “how we worship reflects what we believe and determines how we will live.” In the age of screen worship, media technology has become a determinant of contemplative habits (or lack thereof). Apple’s Steve Jobs was fond of the Hindu saying, “In the first 30 years of your life, you make your habits. For the last 30 years of your life, your habits make you.” Jobs had it printed on invitations to his thirtieth birthday party. The phrase was prescient. Over the next two decades, the technology products Apple created became a global obsession. Jobs’ habits changed the world. The word “habit” comes from the religious apparel worn by clerical orders of monks and nuns. It also means a “customary practice.” The iPods worn by millions of Apple devotees are both apparel and habitual practice. The popularity of listening to digital music, reading electronic books, and browsing the Internet on cell phones is due in large part to Jobs’ inspiration. Apple devices encourage self-expression by inviting spontaneous creativity and personalization. The ads for the Apple iPod are icons of ecstatic self-expression, as silhouetted dancers let loose in fits of choreographed glee, their bodies coordinated with the rhythm of the music supplied by their iPod devices. The faceless shadows that float on psychedelic backgrounds in the iPod ads connote a spiritual happening. The music affects both body and soul. The ability of the iPod ads to evoke religious comparison is a product of their highly metaphorical presentation. Religious communication uses metaphorical language because it proposes realities that cannot be grasped directly. The invisible workings of the metaphysical realm are understood in relation to something sensible and concrete. Religion is communicated through stories, symbols, art, and analogies. The parables in the gospel are common tales of farmers, day laborers, and landowners. Images of fruitful seeds, just wages, and merciful fathers reveal facets of an infinite God to the finite mind. The Buddhist concept of dukkha (suffering) is a metaphorical term that translates as “bad wheel.” The Buddha compared suffering to the bad wheel of an oxcart that makes for an unsteady and uncomfortable ride. The use of metaphor in religious rhetoric makes the metaphysical sensible. The rhetoric of technology resembles religion in its need for metaphors to make the unknown sensible. It is why the steam engine was first explained in terms of horsepower rather than a physics equation. Thanks to artistic engineers like Jobs, computers are filled with easy-to-understand metaphors: folders, desktops, icons, and memory to name just a few. Part of Jobs’ genius was finding the metaphors that resonated with the uninitiated user. While a term like subdirectory meant very little to the average user, putting a file in a folder made perfect sense. Making the computer interface visual and image-based rather than text-based made the experience of personal computing accessible to those who were not computer literate. Eco’s satirical approach reveals the compatibility of religious and technological metaphors. This was not lost on Steve Jobs, who approached new technology with the zeal of a prophet. Undeterred by social critics who saw computers as an expression of dehumanization in the modern age, Jobs saw creativity and life in the cold, beige machines that were taking over corporate cubicles and military installations. Within a decade of starting the Apple computer company in his garage, Steve Jobs staged an ideological battle with computer manufacturing giant IBM over what it meant to be human in the age of machines. Inspired by a sense of spiritual purpose, Steve Jobs warned that an unchallenged IBM would usher in a dark age in which bleak boxes of microchips would turn workers into mindless drones. Jobs flipped the script by imagining computers as mystical tools for unleashing human creative potential. Jobs’ vision of machines as spiritual liberators was enshrined in the famous 1984 advertisement depicting IBM as George Orwell’s Big Brother and Apple as the rebellious hero smashing the shibboleths of the IBM computer culture. The story of our love/hate relationship with technology is best told by the artists. Man and technology are two actors involved in a timeless story about the response of the creator to the created. This is the stuff of myth, poetry, legend, and religion. Adam and Eve, Prometheus, and Frankenstein’s monster all speak to the dreadful and intoxicating proposition of playing God. And it is the sense of dread and overwhelming mystery that evokes the sublime. The sublime can be both a religious sensation and a technological one. In the techno- logical age, it is not just the poets and painters who present the transcendent but the engineers and programmers as well. Advertising has been dubbed the “official art” of capitalist society, and rightly so. Advertising is more than persuasive rhetoric; it is an aesthetic encounter. The mode of persuasion in advertising is not always rational; it is highly emotive. Evocative images, music, and the physical design and contours of a product are seductive; they call upon our sensuality. In the modern cultural climate, where product art is more influential and pervasive than fine art, the proliferation of values and taste changes. Fine art represents human longing by depicting what we believe is true and good and beautiful. In the world of product art we receive a distorted view of the true, the good, and the beautiful. We are shown material goods that are beautified, and we are told that the promises they make are true. Our ideas about the true, the good, and the beautiful come from religious belief. If advertising parodies such metaphysical ideals, then it is also taking a swipe at religion. Such parody is evident in everything from Angel Soft toilet paper to Miracle Whip. The fallout from this semantic hijacking changes the way religion is perceived. Religious traditions are raided for symbols and narratives to enhance the appeal of commodities. When those symbols are abstracted from their traditions and used for other purposes, they are drained of their primordial potency. In certain cases, the products and brands themselves take on a religious significance. The reciprocal use of technological and religious metaphor has led to some imaginative rhetoric over the centuries. Steve Jobs and the Apple computer company embody the blending of technology and religion metaphors remarkably well; they offer a curious mix of the technical and the transcendental, the mechanical and the mystical, the technological and the theological. From Jobs’ esoteric Buddhism to the Apple consumers who proudly declare their membership in the Apple cult, the commingling of religion and technology in the Apple story is a reflection of a persistent and fascinating cultural preoccupation. A society’s most popular technologies provide the all-important metaphors for articulating spiritual concerns. As such, Steve Jobs and the Apple computer company provide hieroglyphs for understanding the sibling relationship between technology and the sacred in the computer age. The advertisements for the Apple computer company are emblems of a culture that has adopted technology as a de facto religion, a religion that celebrates the cult of the individual. Media devices are the means by which we communalize our concerns and ritualize the practice of self-divinization by procuring the powers of omniscience and omnipresence granted by a global communication network. Personal computers, music players, and cell phones fashion us votaries of the digital age, and Apple has imagined our technological conversion in compelling ways. Apple’s advertisements provide a rich visual allegory for reading the transference of spiritual and technological desire in the digital age. Good. Now that we have understand and have established the great power and beauty of The Idol, the extent of its reach and the depth of its power, what are mere Christians going to do about it? Ah! I know! Let’s revere it as a glorious, liberating creature of Almighty God! God made the computer. The structure is fine. Now we need only send it in the right direction. Baal and Moloch have, poor dears, merely been misunderstood. Let’s make sure we can use them for right and good purposes, for the glory of God, of course! After all, Moloch can only consume babies whose superstitious parents throw her into the fire. I can hear Neil Postman, joined by Jacques Ellul, guffawing in their graves, already. Josiah, Jeremiah, where are you when we so badly need you . . . and the Book of Deuteronomy? This article is stupid. Apple is not a “religion”, they are just a company that makes the best products and I buy them because they are the best. You can keep your windows and your android and whatever you think is better, I’ll stick to Apple because it rocks.